On a summer weekend I had the pleasure to photograph two weddings at Atlantis Pavilions Toronto. The biggest challenge for me when photographing the same location, in this case Atlantis Toronto is to come up with different shots so that the wedding photos of the couples don't look the same. While that could prove difficult, in case of Atlantis, it is not that difficult as the place is peppered with gems that can be used creatively if your wedding photographer has the eye and the creativity for such things. This wedding photo was taken on the rooftop and I tried to combine elements of architecture, angle and a bonus, the flying wedding bouquet to create this image. Would this be an award winning wedding photograph? I am not sure about that, but I can tell you I have never seen such image before. The couple loved it and it was included in their wedding album. I love it as well. The first thing that a viewer of this photograph notices is the unusual point of view. 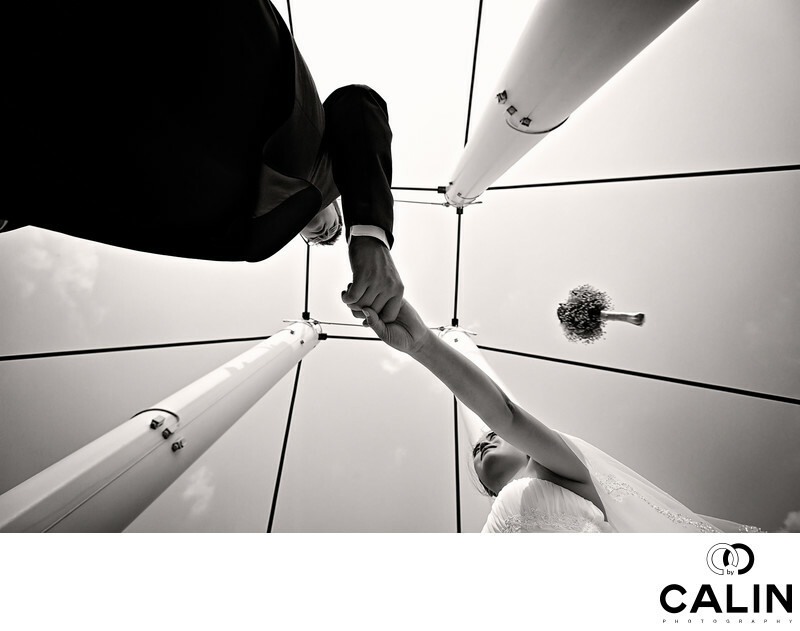 As a Toronto wedding photographer I always strive to be different so to capture this wedding picture I laid on my back and shot upwards. When a wedding photographer does such stunt, the clients reaction is usually a loud wow! That was the case here and upon watching the scene, one of the bridesmaids who had recently got engaged decided to hire me to document her wedding. Besides the unusual vantage point, there are composition elements that make this picture great. The bride and groom are holding hands and forming a diagonal from the top left of the bottom right of the frame consistent with the principle of flow. Also, the high contrast between the subject and the bright sky, or the figure to ground principle, makes the bride and groom pop. This is a symmetrical photograph which includes plenty of geometrical elements creating leading lines towards the subjects. Hong and Rob are such a sweet couple I would do anything for them! They trusted me 100% ...just imagine seeing your wedding photographer dropping on the ground face up to take this wedding picture :-). My photographer partner at one moment climber on a high pole to get a different vantage point...it worked! If you intend to have your wedding at Atlantis Pavilions, I applaud your intention. Atlantis is a fine venue with unique architectural elements. While it can use some face lifts, its unique character and geometry makes it a photographer's dream. The Toronto skyline view is just breathtaking from there! Just visit during the evening and imagine how your wedding photography will look like there. One thing to keep in mind is that the venue can and will run two weddings at once, so it is not uncommon to meet another bridal party there. In fact, once I met another wedding photographer a good friend of mine who was photographing at the same time. Funny things can happen at Atlantis Toronto. To capture this image or use the 24 to 70 mm lens F2 .8 shot at 24 mm. To have everything in focus, I shot this picture at F11. To preserve the unique character of this image I applied a black and white processing.